We start the day of quietly, we are all in need of a bit of a rest. Eventually, everyone is up and breakfasted and we are going to Disney Springs to meet my friend. She’s also over here, so we are meeting for ice cream in Ghiradelli’s, We get there quite quickly, as there isn’t too much traffic, and are quickly parked in the Lime Garage. I don’t think the garages are very attractive, but they are much easier than the old car park, and its nice to be parked in the shade. Phil had a shake which I have neglected to photograph. It maybe on someone elses phone – we have 4 phones and 2 cameras with us, trying to get all the photos in one place is interesting! 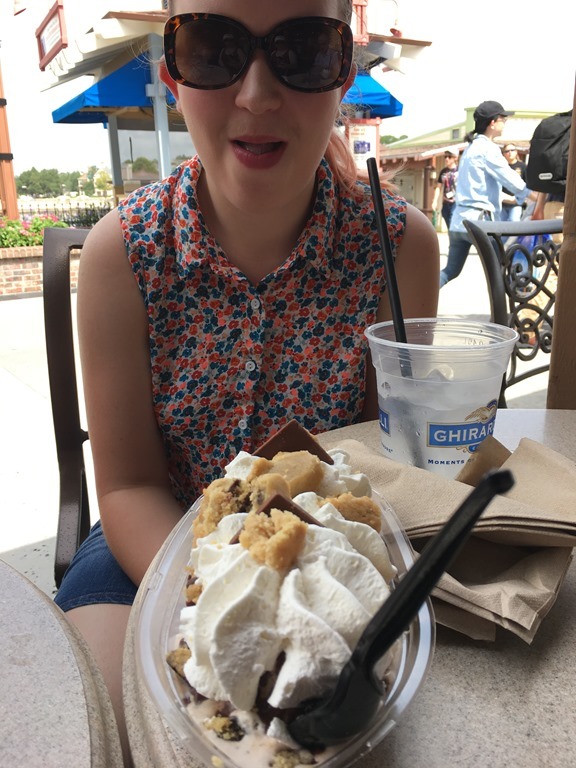 We have been to Ghiradelli before and always had proper glass dishes or plates, so I was a bit unimpressed with the cups and thought they sundaes looked smaller, but they were still huge, so have no fear. 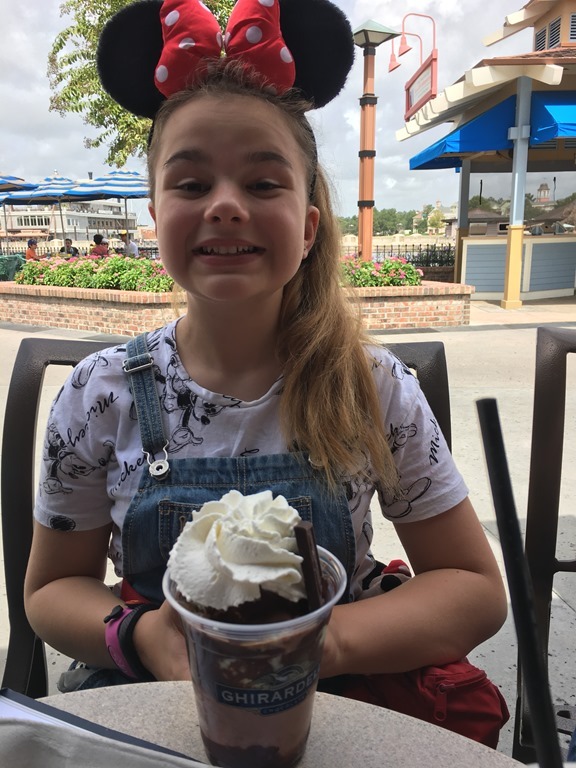 We sat and chatted with our friends for an hour or so, but it was starting to get very very hot where we were sitting, so we said our goodbyes, they were headed to the Lego Shop, but my girls (well one particular girl) really wanted to go dress shopping. Katie had seen the Dress Shop online before we came out, and was very keen to buy herself a dress. She’d tried on the Tiki Room dress last week but it was too big, so we were hoping for a delivery. 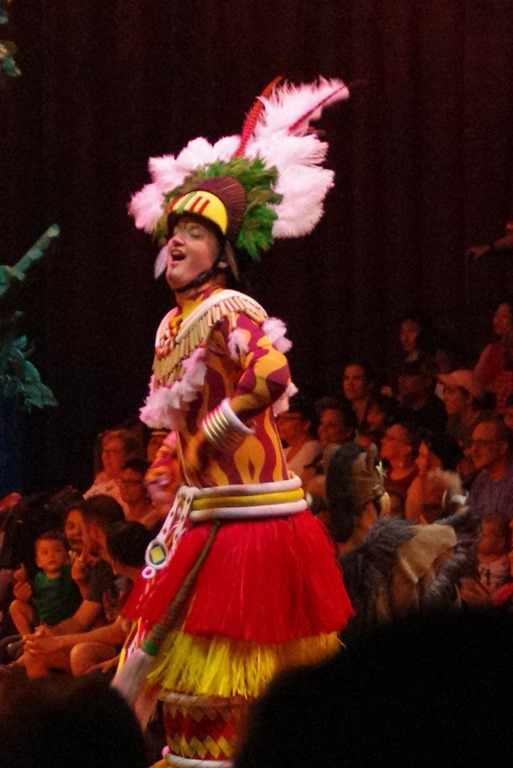 We went in, and there were only a few Tiki Room dresses left, and it appeared they weren’t expecting anymore. They said they had had the delivery in April and hadn’t got anymore since. She was a bit disappointed, but we had a good look at the other dresses, and she tried a few on. She hadn’t tried the Its a Small World dress on the first time, but decided to try it today, and she really liked it. It was very cute, and a bit more ‘everyday’, so she will be able to wear it more often. The straps are a little long so we will need to shorten them when we get home, but it’s not a big problem. 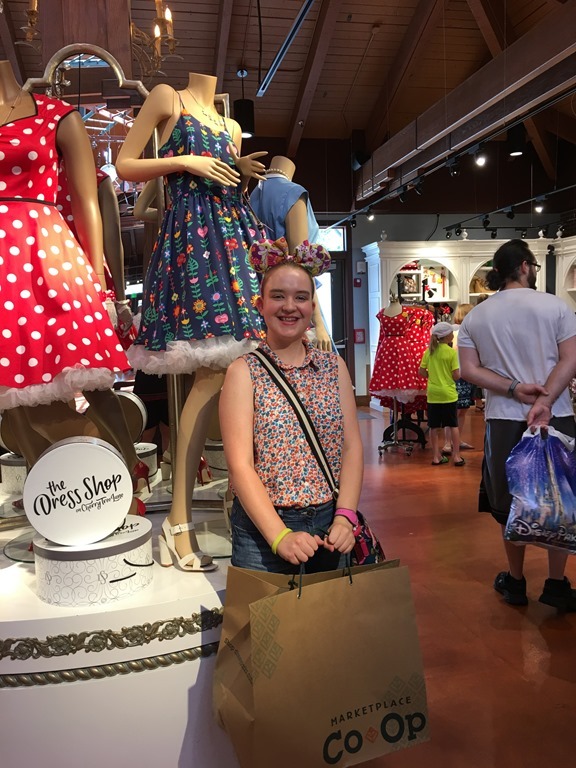 She bought her dress, which came in a lovely garment bag, and she got DVC discount so it was I think $65 which was a lot less than she had budgeted for a dress, so she was really pleased. 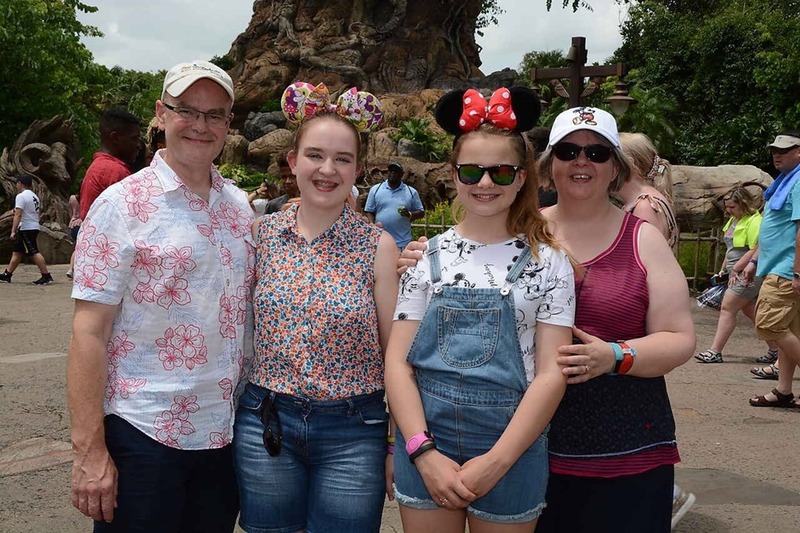 We spent quite a while in the big Disney shop, I wanted a new hat, Molly needed some sunglasses, and I was interested in the Vera Bradley bags, (not that I am likely to buy one, but I wanted a look), they seem to have been discontinued though, we couldn’t find them anywhere. We had a fastpass in Animal Kingdom that was completely unchangable, so we had to leave Disney Springs about 2 and dash over there. 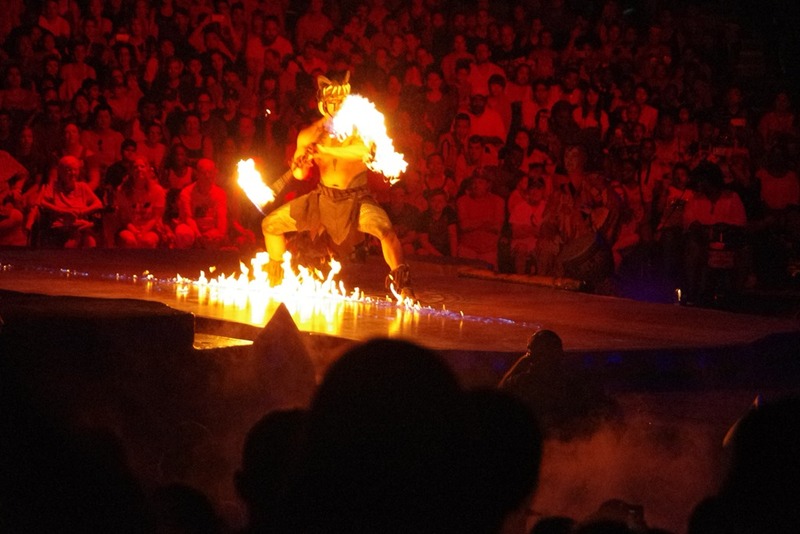 I was hot – way too hot before we even got into Animal Kingdom. We got to the park about 2, and headed straight for Pandora, it looks fabulous. We had a walk around, looking at it all, but I was really struggling with the heat so after we’d checked out the air conditioned shop, we decided to eat in the air conditioned restaurant. We went into the new place called Satu’li Canteen – I think this is my new favourite quick service. We had a beef bowl and a chicken bowl, you use your meat, your “base”, we had potato hash for one, and grains and rice for the other, and then a sauce. We weren’t too sure about the sauces so had them on the side but they were both delicious. These were both delicious and I definitely want to go back again. It’s a quick service but you get real bowls etc, and they have people clearing the tables, so it’s a bit nicer than a typical quick service. After something to eat, and drink I was feeling better, and it was time for our Flights of Passage fastpass. These are hard to get, so I wasn’t going to miss it. The wait time was 120 minutes, but we got to walk straight in, there was a very very short wait just before we boarded our flight, but it was very quick. While we were boarding, they took 2 guests from what appeared to be a single rider queue – if there is a single rider queue then I’d recommend it, as it’s a superb ride, but 2 hours is a crazy wait time. And we saw people still joining the queue so it was only going to get longer. The ride is just amazing, I was a bit nervous as I really didn’t know what to expect. And I was worried about the ride vehicle. Which looks a bit like a motorbike, you sit on it, and then a ‘clamp’ goes on your back and your legs, they are secure but not uncomfortably tight. Once the ride starts, it’s amazing, it really feels like you are flying. It’s very much like Soarin’ but just so much more. You are riding on the back of a banshee, and you can actually feel it breathing. I don’t want to say too much as a lot of people haven’t ridden yet, but it really was that good. We got of the ride, and we were buzzing, it was so good. We walked down into the shop and had a little browse and then out back into the heat. I think it was the hottest day we’ve had so far. 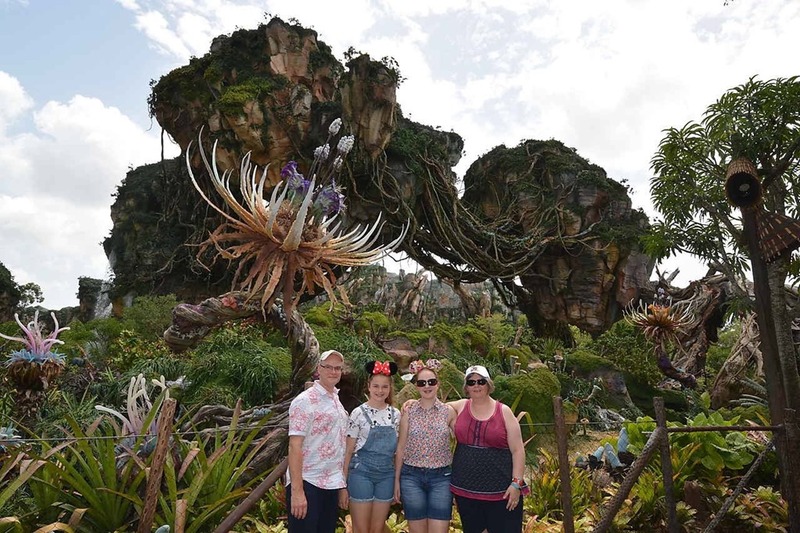 I wanted to do the river ride as well but that was over an hours wait, so I wasn’t up for that, so we left the Pandora area, and did Tough to be a Bug, not the world’s greatest attraction, but it had a 10 minute wait! It has air conditioning. And seats. It was looking like a winner! 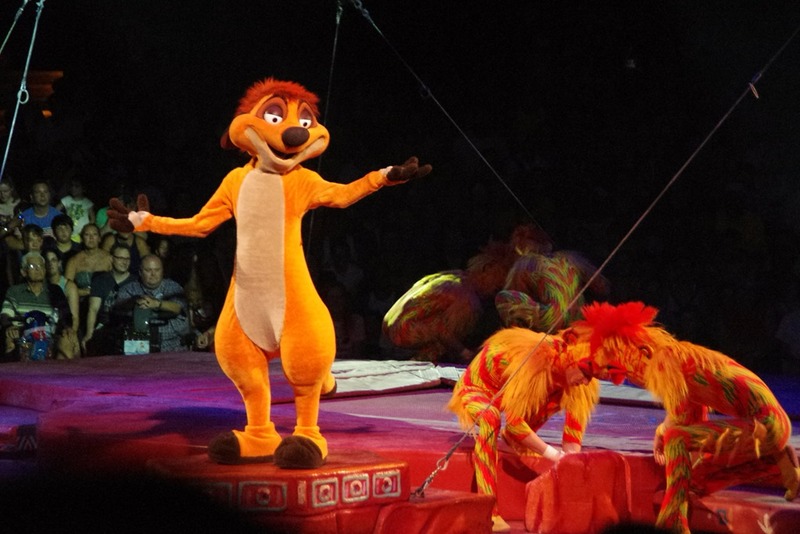 After tough to be a bug, we needed another cool attraction, and so we walked over to the Lion King show. We were in the Lion section, we are nearly always late and end up giraffes, so this was new for us. The show is always great, but I’ve seen it often and always compare the cast to the first cast we saw (who seemed to be around for quite a few years). 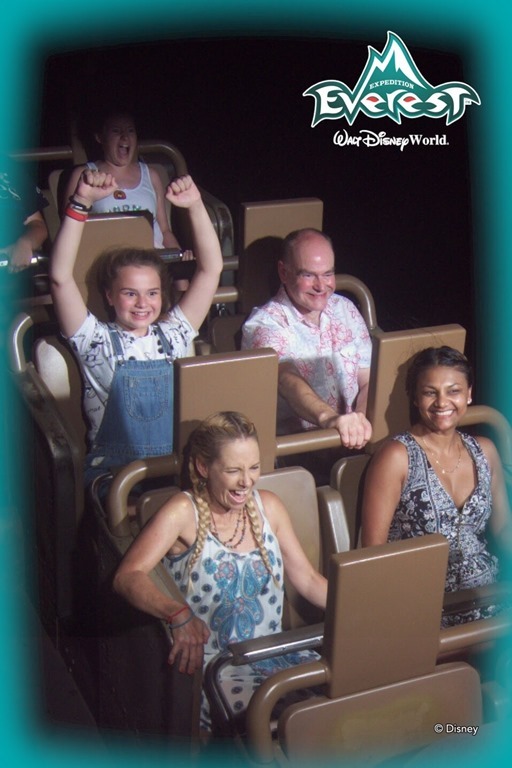 After the Lion King, we had fast passes for Expedition Everest. I’ve ridden this a few times, but I was not feeling up to it today, so I took the bags and got an ice cream while Katie and Molly went for a ride. 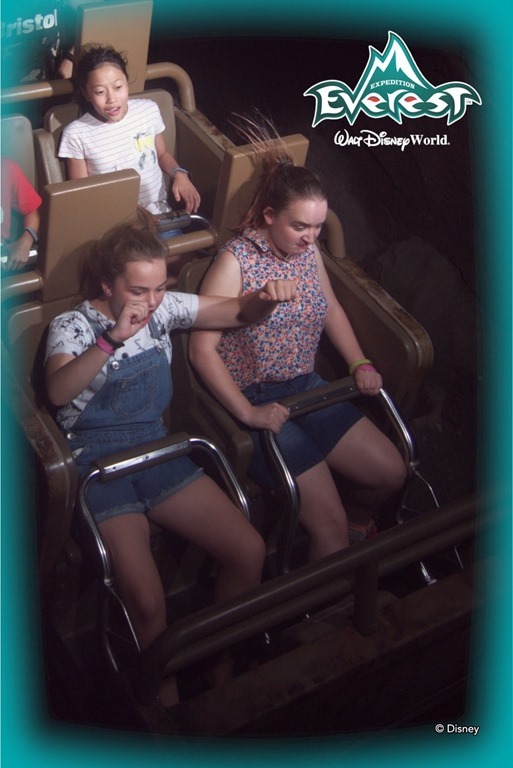 When they came back, Molly wanted to ride again, but Katie didn’t, so she took my fastpass and Phil and Molly rode a second time. After Everest, I’m a bit flummoxed. It’s 6pm, we have fast passes for the Rivers of Light show for 8:30, and there doesn’t really seem to be much to do between now and then. No more Nemo shows for the evening, we’ve seen Lion King (we should have done Nemo earlier as Lion King is on into the evening but we didn’t think it through), a few rides with over an hours wait. We have a bit of a debate, and decide to call it a day. Hopefully we will get back to Rivers of Light later in the holiday. We make it back to the room, an collapse for a little while, and then we reheat our meals from Olive Garden. They were very nice, but each has to go in the microwave individually, so we don’t actually manage to eat all at the same time. I think the girls watched a film, you can borrow films from the ‘community hall’, so Molly has been borrowing a Disney film each evening.